Barry Reese, noted award winning Genre Fiction Author, has brought many New Pulp Heroes to life! One of his most popular has headlined four volumes of books from Pro Se Productions, a leader in Genre Fiction publishing. And now, those four collections are available as one book! 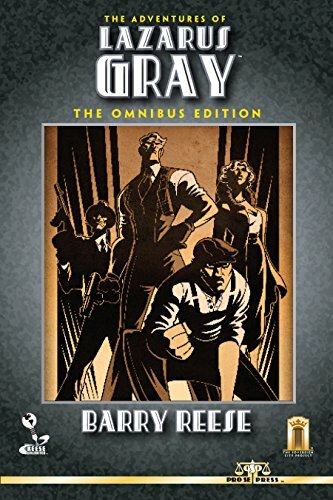 THE ADVENTURES OF LAZARUS GRAY: THE OMNIBUS EDITION is now available as a digital ‘boxed set’ from Reese Unlimited, Barry’s own author imprint, and Pro Se Productions! THE ADVENTURES OF LAZARUS GRAY VOLUME ONE- On the road to discovering the many secrets of Sovereign City, including his own identity, adventurer Lazarus Gray and his Assistance Unlimited team encounter weirdness, madness, and over the top badness on every page! Finding himself naked and not knowing who he is on the shores of Sovereign, a stranger takes a name literally found around his neck as his own and becomes Lazarus Gray! Forming a team of skilled actioners around him, Gray sets off to not only find his own truth, no matter how horrible, but to shine light on the darkness that plagues Sovereign City! THE ADVENTURES OF LAZARUS GRAY VOLUME TWO: DIE GLOCKE- Lazarus Gray and his aides in Assistance Unlimited return for what may prove to be their greatest challenge... What is the secret of Die Glocke? Will Lazarus Gray and his teammates discover the answer in time to stop a power hungry madman and his undead soldiers? The Adventures of Lazarus Gray returns with an epic adventure where the fate of the world is at stake. Is even Lazarus Gray up to a task that could take him to the very gates of Hell itself? Also, Assistance Unlimited takes a case that will bring them face to face with Terror and the making of a Hero! THE ADVENTURES OF LAZARUS GRAY VOLUME THREE: EIDOLON –In the third volume of Gray’s adventures, Lazarus Gray and his aides in Assistance Unlimited battle against their opposite number as some of their most dangerous enemies band together to form MURDER UNLIMITED! They've sworn to destroy Lazarus and his team, but is there another agenda that secretly guides this sinister alliance? Also, Gray squares off with a new foe- Eidolon! Who or what is this latest adversary! Follow Gray as he works out a puzzle that began in the steamy jungles of Peru and may end with the fall of a hero! Also presenting SECRETS OF THE DEAD, the first in a series of illustrated features by Barry Reese and Award Winning Artist George Sellas! THE ADVENTURES OF LAZARUS GRAY VOLUME FOUR: SATAN'S CIRCUS- Two tales of pulse pounding action fill the fourth volume in the adventures of Lazarus Gray! In the first, Gray unites with the mighty Thunder Jim Wade to confront a menace from his past and in the second, the mysterious pair of vigilantes known as The Darkling and Eidolon return in a dark tale that reveals hidden secrets that will shake the world of Lazarus Gray to its very core! One fantastic hero created by one talented and prolific author. Four Volumes bound together in a digital boxed set for fans of New Pulp and Genre Fiction everywhere. THE ADVENTURES OF LAZARUS GRAY-THE OMNIBUS EDITION, with eBook formatting by Russ Anderson, cover art by George Sellas, and cover Design by Sean Ali.. Get your copy for only $2.99 from Amazon at http://tinyurl.com/o7uhlt6 and from Smashwords at http://tinyurl.com/pq4loek.